Type your question in the box below. Blood Trail: This three card reading reveals the past, present and future influences on any situation. It is important to remember that the future card is not set in stone but rather shows the direction in which the situation or issue is flowing. Any changes you make, especially those relating to the other cards in the spread, will alter the flow. Look especially at the narrative across the three cards and how they are linked. How is the lifeblood changing? You may be presented with a deeper understanding of how an issue developed, the reason for a present situation to bring about a positive future, or a difficult lesson you need to learn. Book of Shadows: This reading helps you discover difficulties underpinning any issues. It is a six card reading conisisting of three pairs that represent past, present and future. One card represents the positive aspect of the time frame while the other is the shadow or negative aspect. This shadow card represents a lesson that needs to be learned or a difficulty that must be faced. The Elemental Cross: This six card spread gives a detailed account of all the forces at play within a particular situation or issue. The first card represents the basic issues around the question, an overview of your concerns, the situation in its essence. The next four cards represent the basic elements: Earth, Air, Fire, and Water. 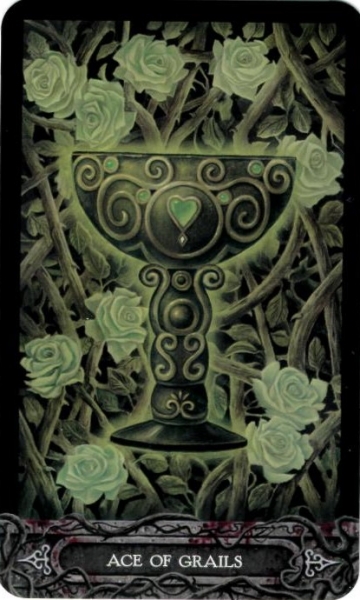 The final card represents the element of Spirit, the secret key to unlocking the treasure contained in the cross.